1914. 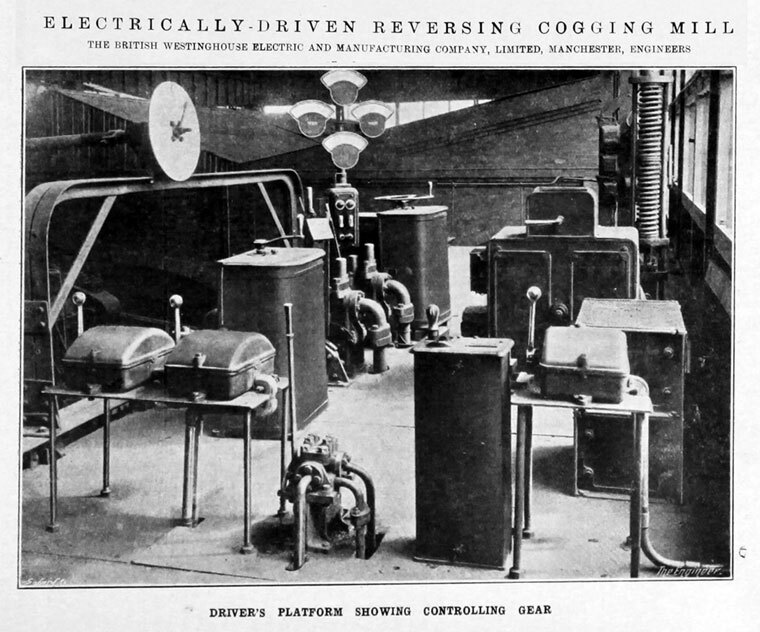 Electrical aisle in companies' works. 1918. 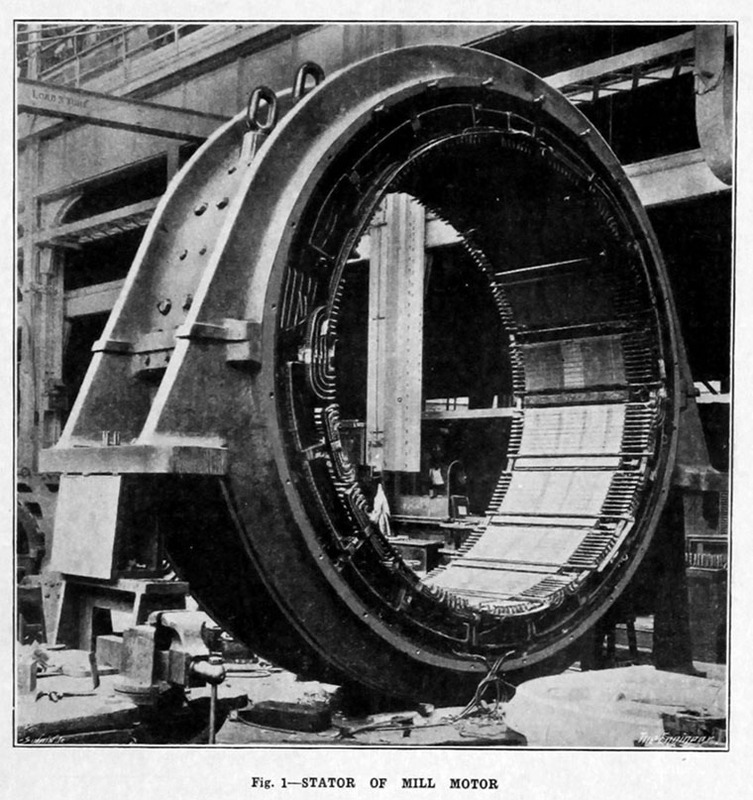 Stator of Mill Motor. 1947. 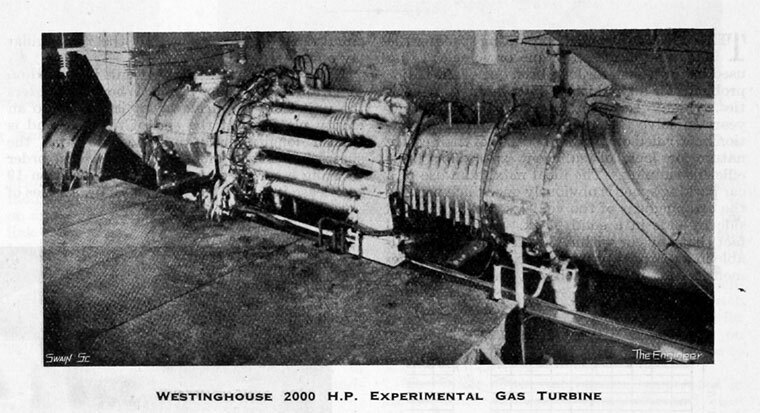 2000 HP experimental gas turbine. 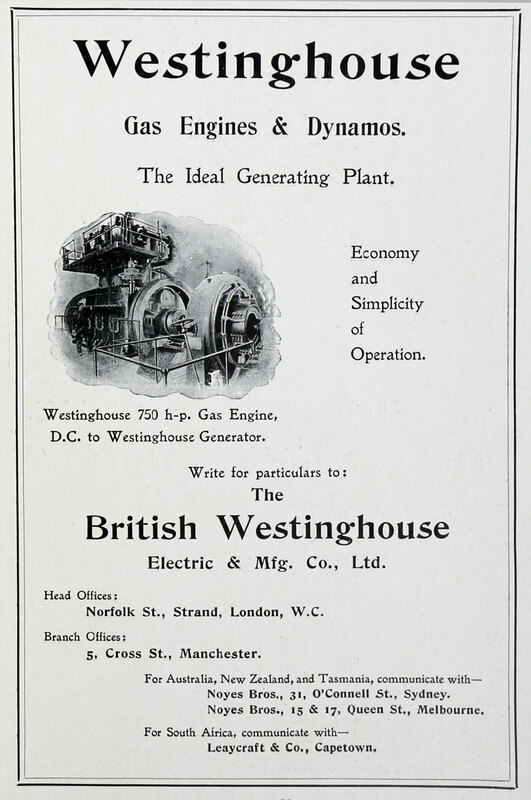 British Westinghouse Electric and Manufacturing Co. of Westinghouse Building, Norfolk Street, Strand, London (1908). 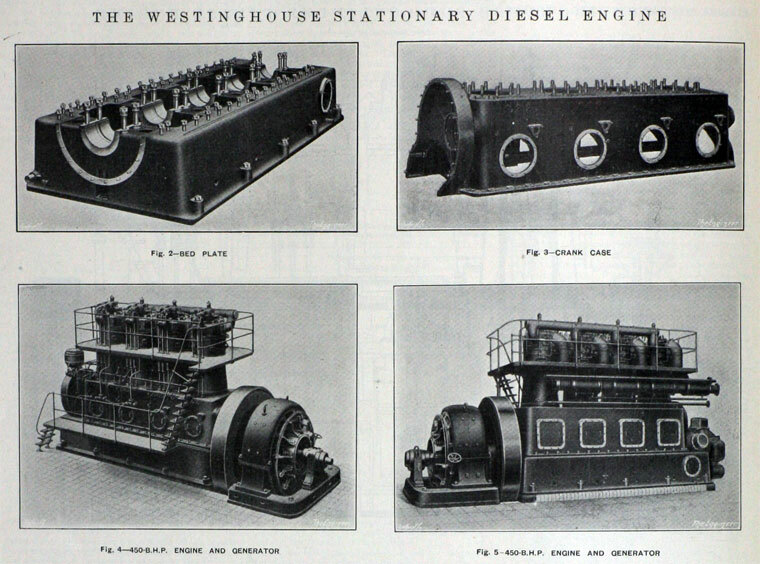 1889 George Westinghouse set up the Westinghouse Electric Co Ltd of London. 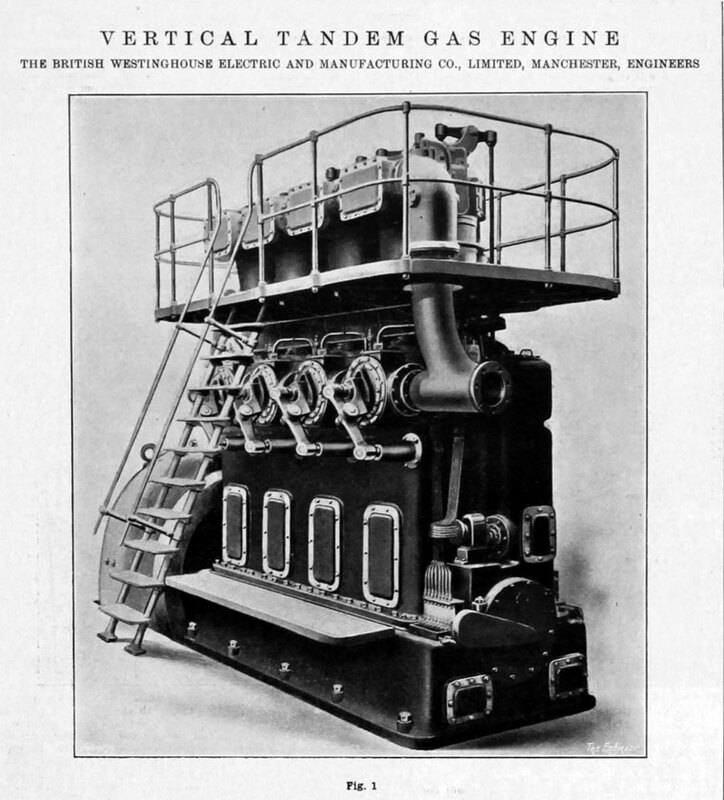 The London Company was an agency for selling and installing the products of the Electric and Manufacturing Company in Pittsburgh. Westinghouse transferred his patent rights for all countries outside North and South America to the new company. The company started with a staff of five in Old Broad Street, later moving to 32 Victoria Street. 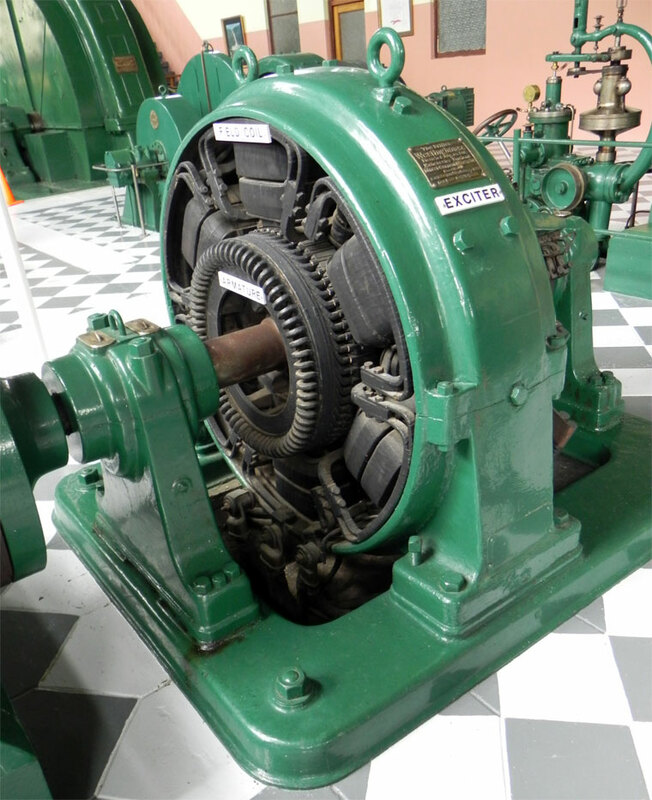 The products consisted of gas and steam engines and a wide range of electrical goods—generators, transformers, switchgear, meters, motors, control gear, and arc lamps. 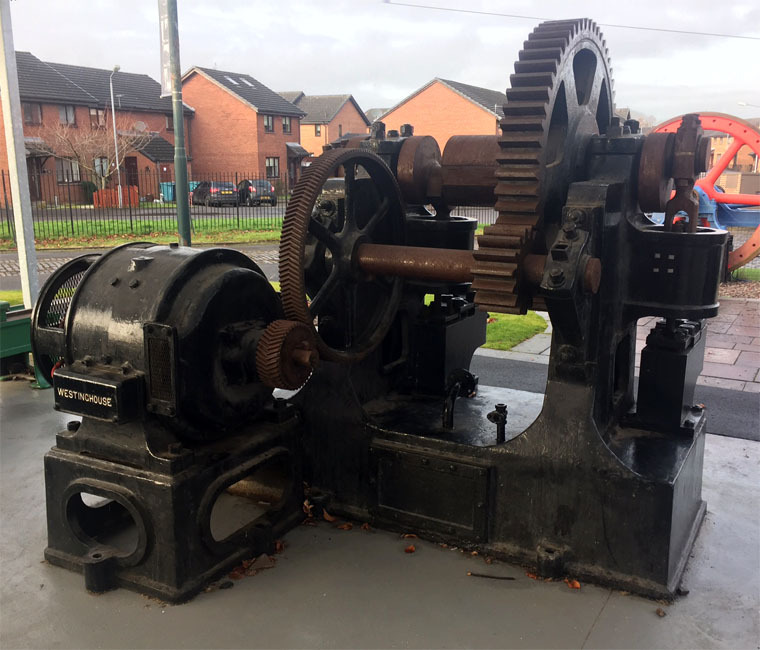 The London Company also took over an existing contract for the Sardinia Street Power Station of the Metropolitan Electric Supply Co. Later, some important contracts were obtained for power stations such as Willesden and Bankside and for electric tramway systems. 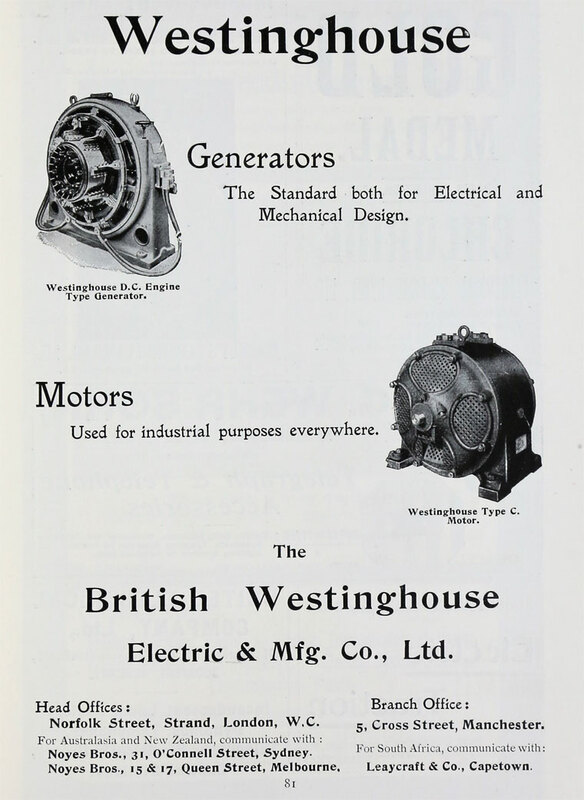 1889 Seeing the opportunities in the UK, George Westinghouse formed British Westinghouse as a limited company as a manufacturing subsidiary of the American Westinghouse Electric and Manufacturing Co. 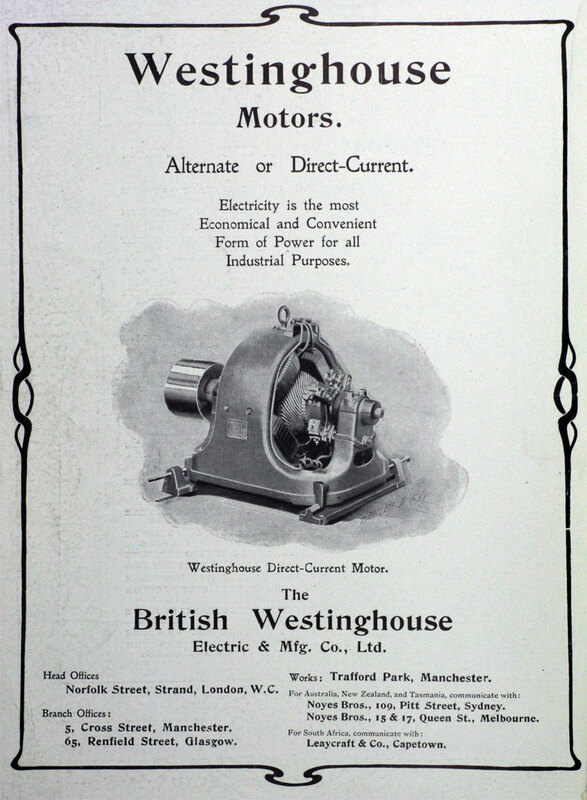 The British Westinghouse Electric and Manufacturing Co was registered on 10 July, and acquired certain rights for the United Kingdom, its colonies, possessions, and dependencies, except North America, from the Westinghouse Electric and Manufacturing Co and the Westinghouse Machine Co of the United States, while the company has since acquired the right to extend their sales in South America. 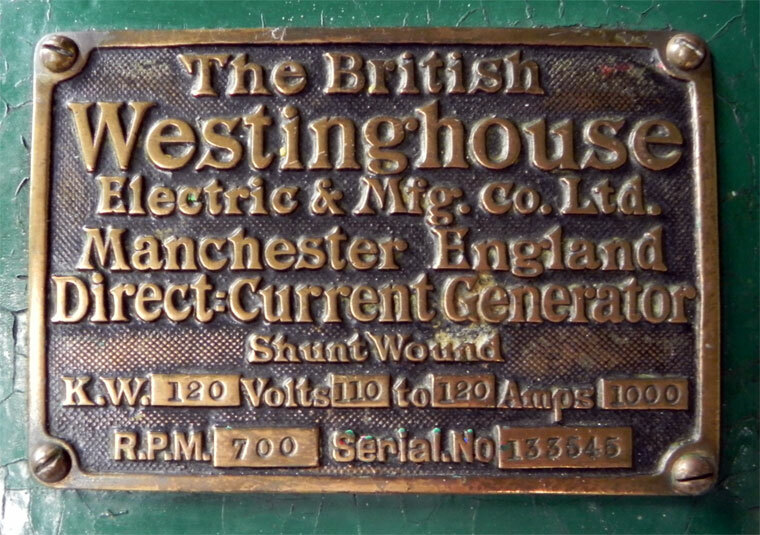 1899 British Westinghouse was located at Trafford Park, Manchester from 10 July 1899 to 8 September 1919. 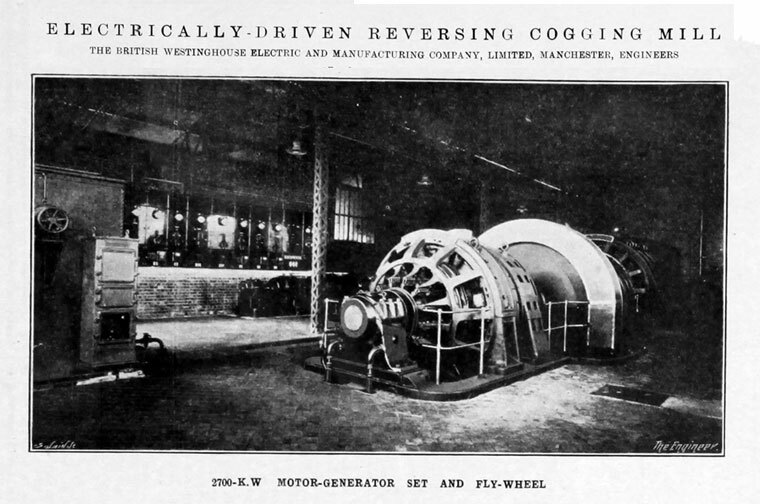 George Westinghouse's ambitions for his British enterprise were to prove to be greater than was justified by the market and the large Trafford Park factory did not operate at full capacity until WWI started. 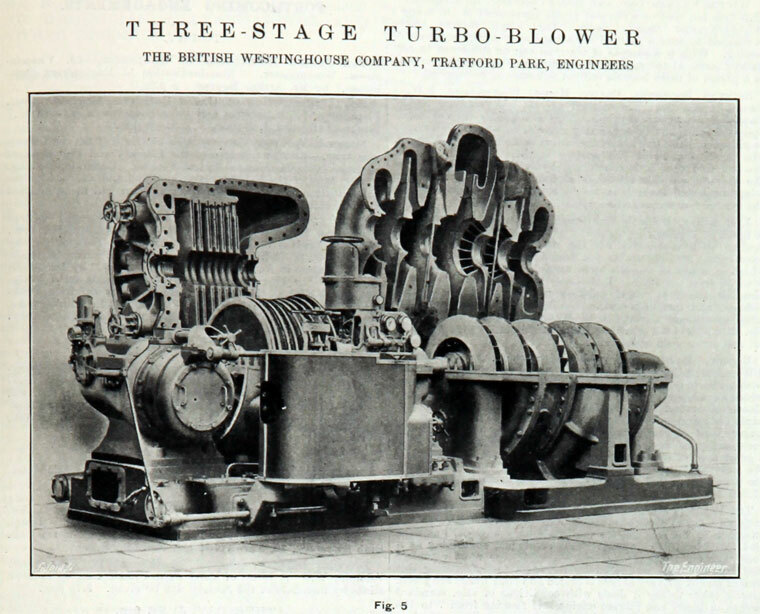 c.1900 Produced three engines for Shore Road Generating Station, Mersey Tunnel Railway. 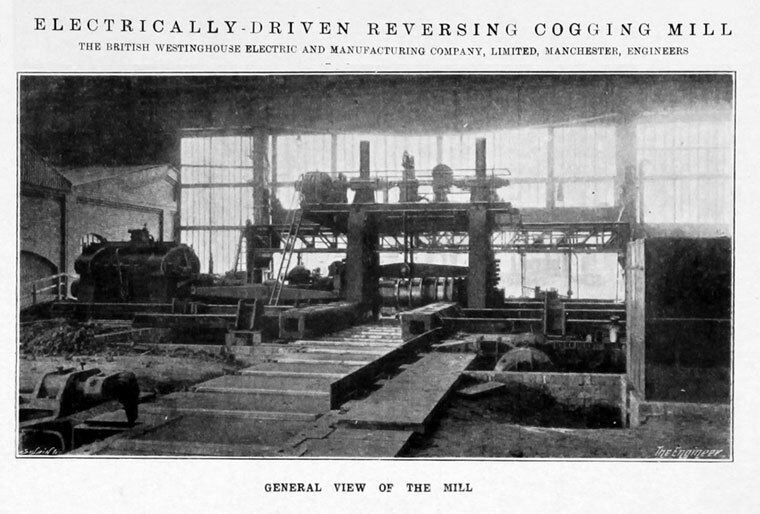 1902 Manufacturing began. 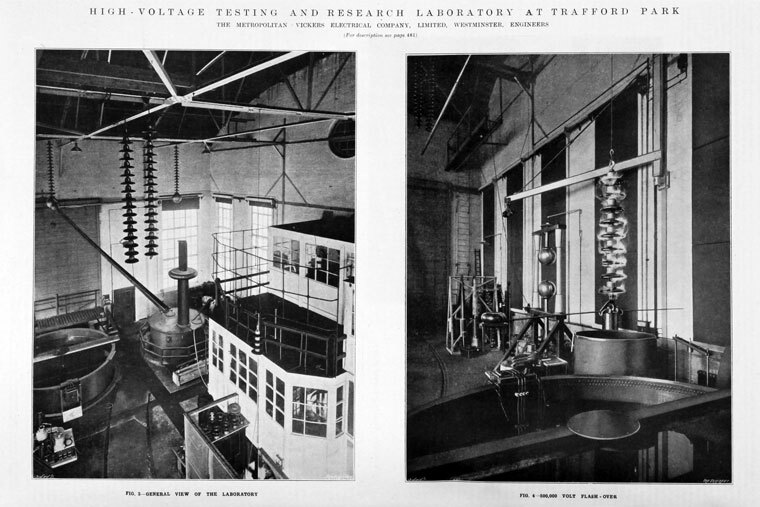 The competition between BTH and British Westinghouse mirrored that between the parent companies, GE and Westinghouse, in America. 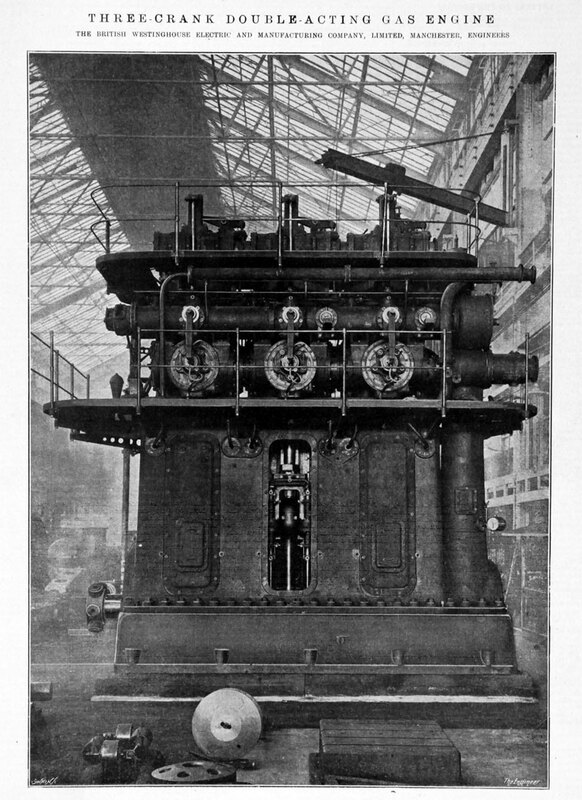 1901 Contract for the Mersey Railway electrification was signed including generating station, feeders, collector rails, trains, and tunnel ventilating and pumping machinery/ Almost all of the equipment was made in America. 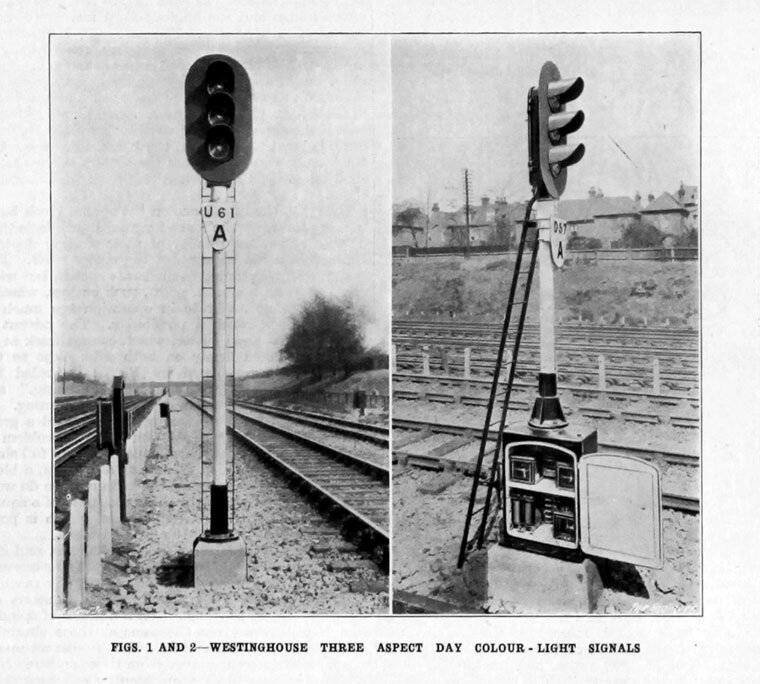 c.1903 Contract won for the electrification of the Metropolitan Railway, including multiple-unit trains and locomotives. 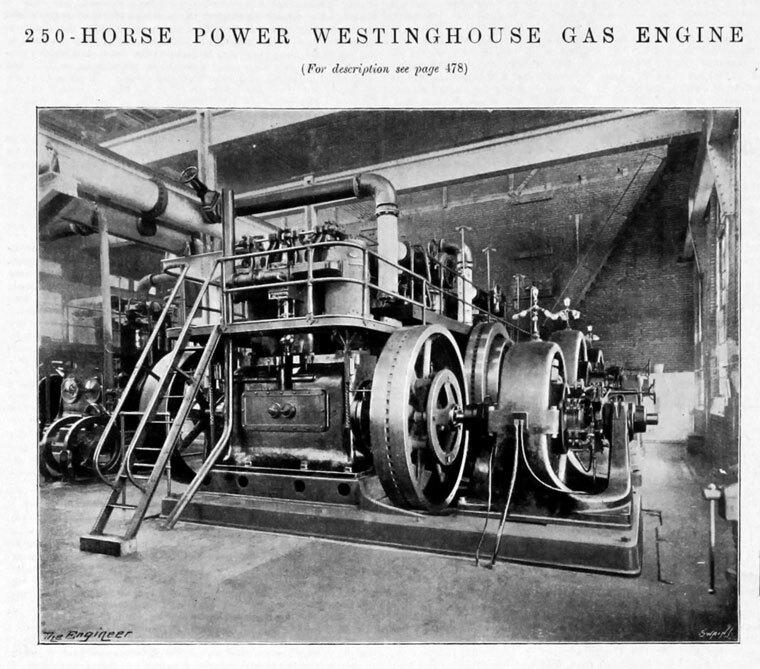 1907 Westinghouse USA went into receivership with the result that executive control of the company was taken away from George Westinghouse, though he remained as President. 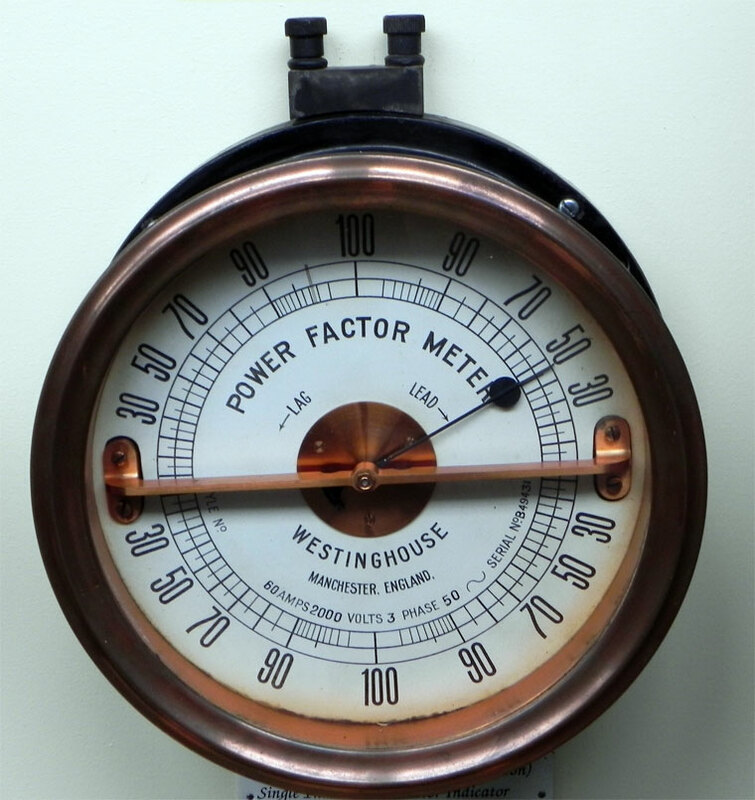 Another effect of this was the increased independence of British Westinghouse. 1910 This independence was reinforced when the board voted to remove George Westinghouse from his role as Chairman. 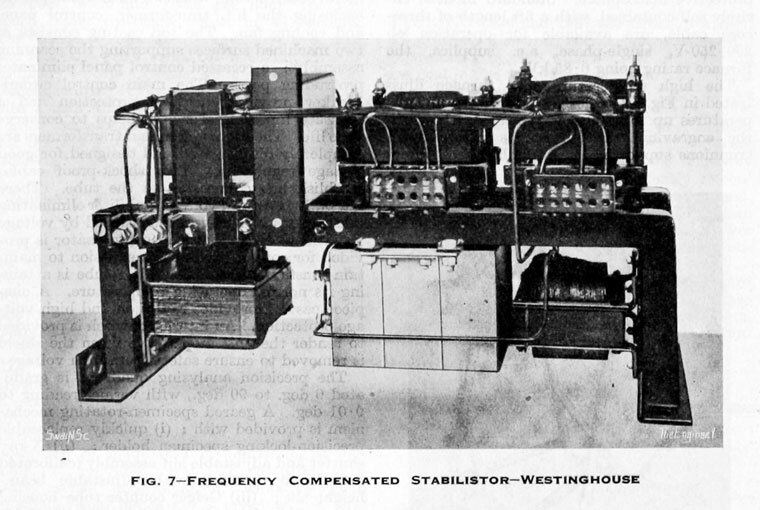 American Westinghouse did retain over half the shares however. 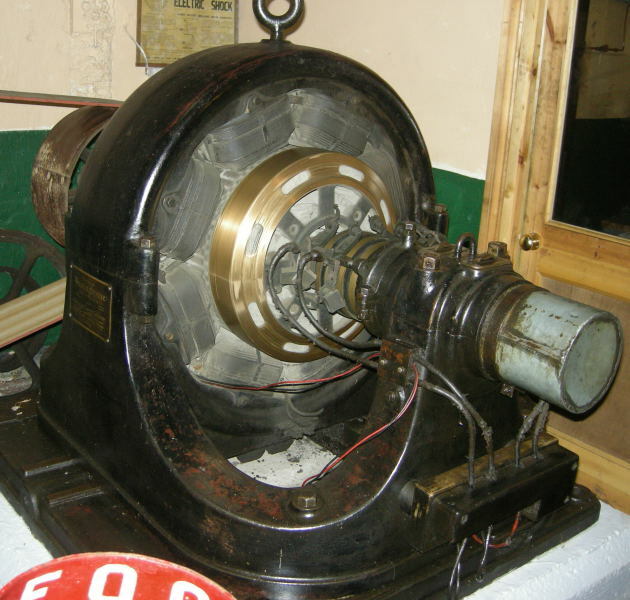 1910 Started to manufacture steam turbines which developed into a major area of business. 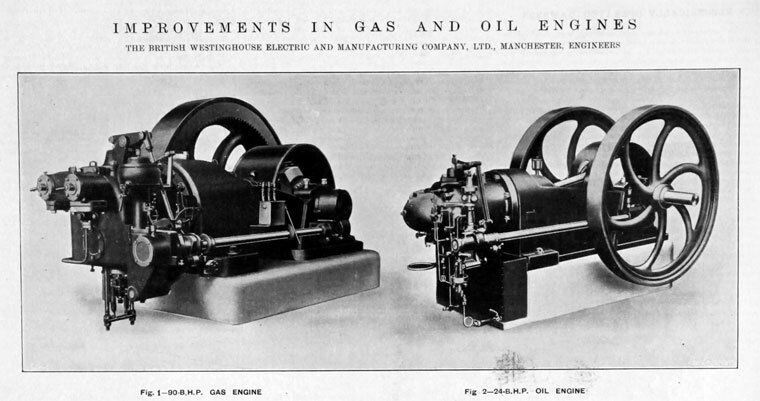 1911 British Westinghouse Electric and Manufacturing Company - Catalogue on horizontal gas engines from 2 brake horse-power upwards. 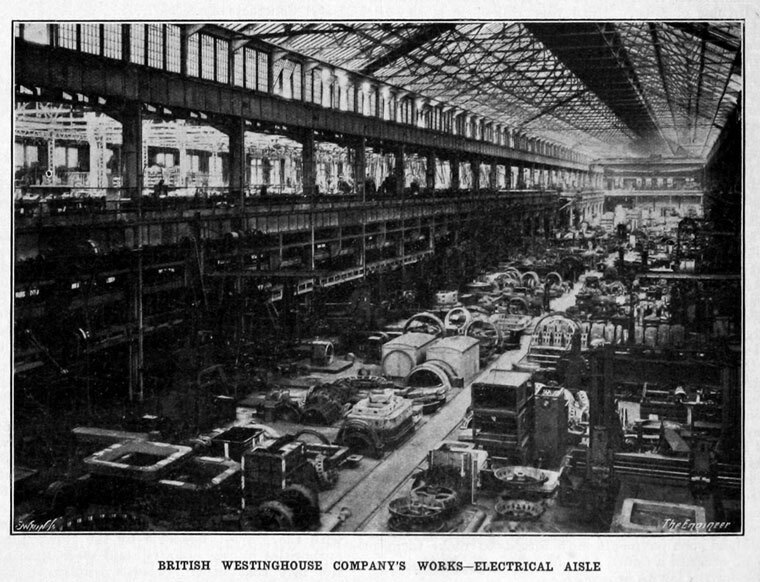 1916 British Westinghouse felt that the American ownership of its operations during World War One had been a hindrance, so a British holding company was created to obtain the American shares. 1917 A lamp factory at Brimsdown, Middlesex, which had belonged to a German company, was taken over by the Public Trust Custodian in 1915. Two years later it was bought by the Company to make drawn-wire filament lamps under the trade name Cosmos. The Cosmos Lamp Works Ltd was formed on July 23, 1917. 1917 The Metropolitan Carriage, Wagon and Finance Co provided the capital for British Westinghouse to become independent of US control. 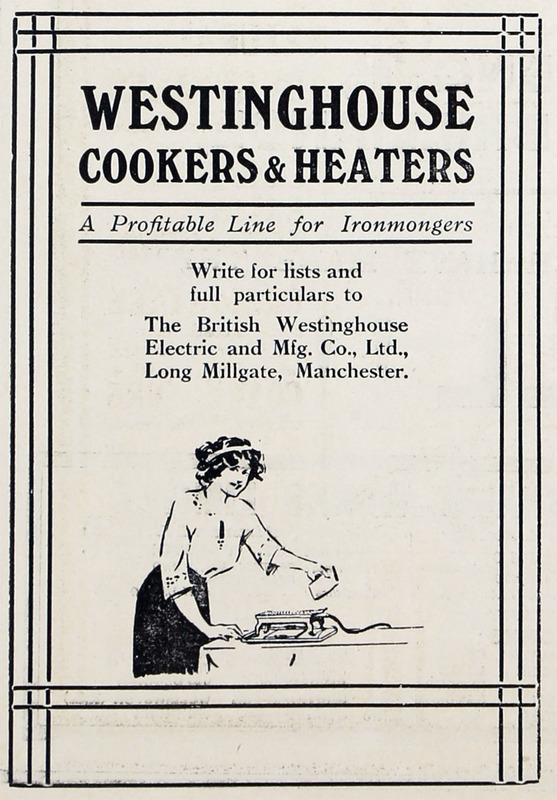 The company was called British Westinghouse Electrical and Manufacturing Co.
1919 Vickers Ltd acquired the Metropolitan Carriage, Wagon and Finance Co and with it the British Westinghouse. 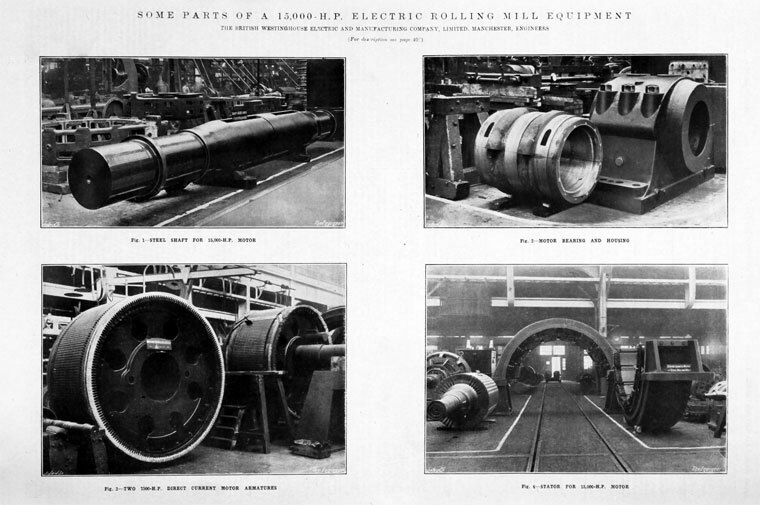 Vickers wished to be able to supplement their production of steel, ships, trains, and machinery with that of the associated electrical equipment. The company’s name was changed to Metropolitan-Vickers Electrical Company on September 8, 1919. 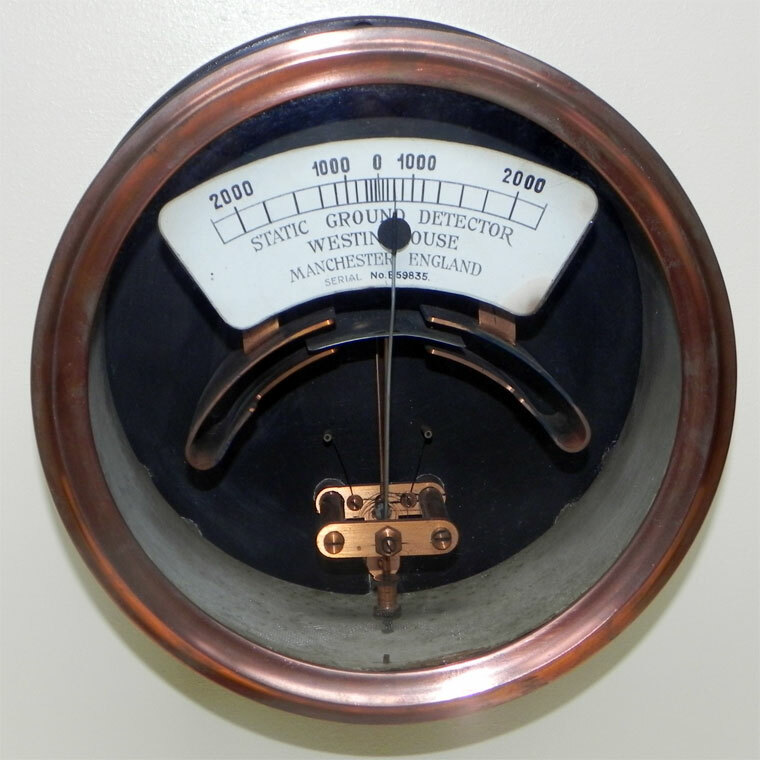 In 1929 the Metropolitan-Vickers was merged with the British Thomson-Houston Company and the Edison Swan Electric Co and Ferguson Pailin to form Associated Electrical Industries. 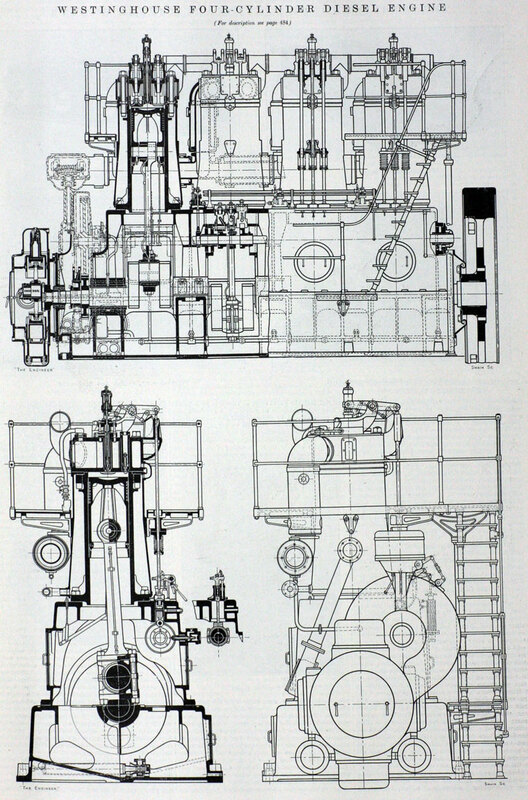 ↑ The Engineer 1911/04/21 p 422.